Today customers are demanding more from their vendors; as a result both are looking for ways to cut costs. As the complexity of software systems increase, so do the challenges faced by customers and vendors. These challenges go hand-in-hand with an increasing number of tedious tasks that consume precious time and conspire to erode your productivity. The Industrial ECatalog web-based application is an advanced, highly customizable online catalog, that allows vendors and customers to create, save and manage multiple shopping carts. Integration into MRP and ERP solutions allows for seamless Punch-Out and EDI operation. 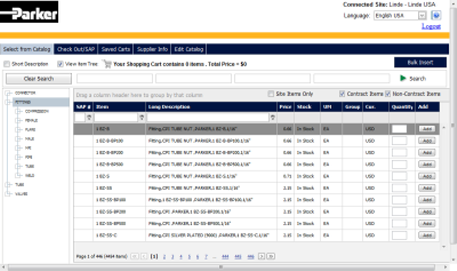 vendors and customers can create and view shopping carts allowing for a unique level of interaction, enhancing the purchasing process. shopping carts are saved indefinitely, allowing customers and vendors to recall information when required. This is useful when looking up past projects history and requisition information. customers to have a single user interface for all suppliers, reducing training, mistakes etc. provides a single standard platform to conduct business with suppliers.